The article considers Karl Marx, an outstanding thinker, who thanks to his knowledge of philosophy, history, and economics has managed to predict the stages and forms for economic, social and, substantially, spiritual development of peoples. His vision of the future is based on the thoughtful, real, and significant understanding of the economic activity of human society. Generally, the scientific community with rather deep and sincere respect paid attention to his ability to expect the future for centuries forward. This article is not just a tribute to the 200 anniversary since the birth of the genius. Now in the 21st century, K. Marx’s anniversary is, first of all, the recognition of his genius. Living now, we see the economic, social and spiritual development of humanity in the conditions of convergence of science, education, quality of life, human health, warm-heartedness and credibility in overcoming even small challenges. We strive for a careful attitude to nature, rational use of its gifts and natural wealth. Only in such harmony, the mankind will have a happy future. Reflections on the features of Karl Marx’s creative method (1818–1883) are presented in the genre of intellectual history. In this framework, I analyse the influence of exogenous and endogenous factors on the research process, on the personality of the scientist as well as on the choice of the directions of scientific inquiry, etc. In this respect, the 200th anniversary of the scientist’s birth provides an excellent opportunity to consider various features of his scientific activity and how a variety of reasons influenced it. Along the description of K. Marx’s life, I revealed and characterized such peculiarities of his creative method as the interdisciplinary nature of research activity, thorough and comprehensive selection of material for analysis, the desire to prove each theoretical position in several ways, the ability to recognize the limitations of his capabilities, and the readiness to correct his position. However, K. Marx remained true to his two mottos. One of them is “De omnibus dubitandum”, which distinguished him as a scientist, since it is doubt that creates the need for the analysis of phenomena of the surrounding world. The other one, “Nihil humani a me alienum puto”, testified that K. Marx was an ordinary man with his weaknesses, shortcomings, etc. For example, he usually published only the first parts (volumes) of his iconic works. In general, K. Marx as a scientist and as a man managed to give an intellectual charm to the idea of a proletarian revolution. Moreover, Marxism is still in demand as a research area of social sciences. The article analyses the differences in views between K. Marx and A.I. Herzen on the prospects of economic development of Russia in the second half of the 19th century. The paper shows that K. Marx proved his views relying on the development of the industry, which had created conditions for the extension of the individualistic capitalist relations as well as for the appearance of the proletariat. A. I. Herzen paid more attention to the community relations, which gave to the Russian capitalism national specificity. A considerable part of the differences between the views of K. Marx and A. I. Herzen on the prospects of economic development of Russia is connected with their attitude towards the Russian rural community. Therefore, the article reveals their understanding of this phenomenon. K. Marx understood the community in connection with land ownership. However, A. I. Herzen attributed different social aspects to the community, as well as discussed communal self-government. For the first time, I define their mental perception of the opportunities of social transformations in Russia as one of the main differences in views between K. Marx and A.I. Herzen. K. Marx was shaped by the values of industrial and urban society. Therefore, he looked at the prospects of economic development of Russia through the materialistic understanding of history, and considered the proletariat as the driving force of transformations. A. I. Herzen’s way of thinking developed under the influence of the Russian mentality. As an artist and writer, he adhered to a figurative and intuitive, emotional type of thinking, which is closer to the rural life. He supported the change of a social regime, but considered that one should not destroy all the previous orders simply because they were old. He thought that it was necessary to understand the features of national mentality, and that the Russian collectivism was suitable for socialism more than the Western European individualism. I have proved that the differences of opinion between these two scientists are directly relevant to a challenge of choosing the road for the development of Russia in the 21st century. The collectivistic origins are to be considered, as well as the ideas of a social imprinting when forming the modern Russian capitalism. I have concluded that there were no serious differences in opinion between K. Marx and A. I. Herzen on the prospects of economic development of Russia in 19th century. There were certain divergences in views on understanding the Russian society. These divergences allow to see the beginning of essentially new approaches to the socio-economic development of modern Russia. Over the past two years, Russia has become the world leader in grain exports and intends to maintain growth rates. The authors enter into polemics with scientists who estimate the export of grain as the success of the agrarian economy. The purpose of the study is to find arguments for proving that the current model of the food market formation is erroneous. This model is based on the export of grain in combination with the import of the food with high added value. Our hypothesis is that the export of grain abroad was the result of low demand in the domestic market, which is due to the structural deformation of agricultural production. The study is based on the works of scientists in foreign trade policy (D. Ricardo, F. List, B. Ulin, S. Witte, D. Mendeleev). Statistical data, include the period before the embargo on food (2012–2014) and after it (2015–2016). In the conditions of inflation, preference was given to the indicators of the physical volume of output. The situation on the food market is complicated by a decrease in consumer demand and a fall in real incomes of the population. The imposition of an embargo on food imports reoriented imports to other countries. We propose measures of state regulation of the agro-food market: the introduction of export duties on grain and export subsidies for products with high added value. The research results can be used to develop mechanisms for regional economic policy in the agro-food sector. The regions of the Russian North occupy 70 % of the territory of the country. These areas considerably differ in the level of socio-economic development. Khanty-Mansi Autonomous Okrug (KhMAO) — Yugra is the most developed industrial region of the Russian North. KhMAO is also the main supplier of oil and gas resources. Thus, KhMAO is the focus of the research. The purpose of the paper is to evaluate how the traditional natural resource management transforms on the developing territories and to assess its impact on the lifehoods of the Small Indigenous Peoples of the North (SIPN). The study is based on the hypothesis of the negative impact of industrial development on the territory of the traditional residence of SIPN and, accordingly, on their social and economic development and the quality of life. We have found certain intraregional distinctions of this territorial subject of the Federation. These differences are caused by the features of natural and resource potential, transport security and geographical location. It is true for both the separate municipal entities and larger territorial and administrative sub-regions. We have identified the most acute problems in the development of traditional natural resource management on the territories of active industrial and transport development. The main industries there are reindeer breeding and fishery. We also identified the problem of the northern legislation set up to protect the rights of SIPN. The paper considers the evolutionary changes in the formation of the institution of ancestral domains and the territories of traditional natural resource management, as well as the practice of coordinating the interests of subsoil users and SIPN’s representatives with the help of economic agreements. We have demonstrated the problem associated with the difficulties of social adaptation of SIPN. We have analyzed the ecological situation and current state of traditional environmental management to compare the conditions of municipal entities of the region. Using ethnic social and ecosystem approach, we have evaluated the lifehoods of SIPN in the developed and poorly developed regions of KhMAO. The results of the assessment support the hypothesis of the research. The findings of the research can be used when working out on the roadmap of the development of traditional industries and SIPN in the municipal districts of various development level. The partnership of the state and business is one of the powerful tools for solving socially significant tasks of a region. The annual rankings of regions as regards the level of public-private partnership development do not take sufficient account of the initial economic and investment conditions for the development of regions. Moreover, it hampers assessing the effectiveness of the regional authorities in the sphere of public-private partnership. Therefore, the identification of economic preconditions stimulating or, on the contrary, restraining the development of public-private partnership in the subjects of the Russian Federation is relevant. The article describes the main trends in the development of public-private partnership in the Vologda region. The study is based on the rating assessments of the level of public-private partnership development in the regions of the Russian Federation, as well as on the socio-economic ranking of regions and the rating of their investment potential and risk. To achieve the goal of the study, the methods of dynamic analysis, modelling, and structural analysis as well as statistical methods are used in the article. The research has shown a strong correlation dependence of the development of public-private partnership in the region on its economic and investment situation. The Vologda region ranked 29th place in the public-private partnership development rating in 2016. I substantiate that the region should occupy 44th place in this rating taking into account economic and investment conditions, and under the optimistic scenario, it could take the 9th place. It indicates the reserves for the development of the public-private partnership in the region. The author’s coefficient of the application of economic and investment conditions for the development of public-private partnership in the Vologda region is 1.52, which indirectly confirms the effectiveness of government decisions in the sphere of public-private partnership. Further research in the field of the formation of conceptual bases for the public-private partnership development taking into account the industrial features of the Vologda region will contribute to the development of public-private partnership in the Vologda region. When developing regional strategies, the effectiveness of energy solutions must be linked to the overall economic efficiency of regional development, since the targets for energy-efficient development may conflict with the objectives of the regional economy as a whole. In the article, the task of energy-efficient development of a region of the Russian Federation is reduced to the search for the agreed scenarios of the development of fuel and energy complex (FEC) and the regional economy. These scenarios allow achieving a maximum approximation to the stated goals for the set of energy and economic indicators. I have developed a model of the FEC of a region as a dynamic CGE-model. 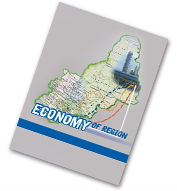 It is developed as a part of the general model of the socio-economic activity of a region. This model represents the interrelated processes of production, processing, transportation and the use of all types of fuel and energy resources in a region. I propose the forecasting methodology of balanced development of the economy and fuel and energy complex. This methodology provides iterative harmonization of forecasts for consumption and production of energy based on regional fuel and energy balance (FEB). At the same time, the FEB developed within the framework of the FEC model is a part of the overall product-sector balance of the economy, which plays the role of the “balance of balances”. It allows to simulate the interaction of FEC and the rest of the economy through inter-balance relations. Based on the developed methods and models, I have implemented the information technology of situation forecasting and strategic planning in the form of forecasting and analytical tool. This tool simulates the scenarios of energy-efficient development of the economy of the Samara region. As an example, the article presents the assessment of energy efficiency for an option of Samara region development according to the target scenario of Russia’s Energy Strategy for the period up to 2035. One of the worldwide modern instruments to increase power efficiency is the price-dependent electricity consumption. It is one of the elements in managing the demand for power consumption. The programs of price-dependent power consumption are globally relevant. However, in Russia, their development is still on a conceptual phase. This paper analyses regional tariffs for the power transmission from the perspective of encouraging consumers to price-dependent demand management for electricity consumption. We examine the structure of final electricity tariffs for various categories of consumers as well as identify the percentage rate for the electricity transmission for each category. We consider the methodology of single-part and two-part tariffs for electricity transmission, their structure, and advantages of application. On the example of Volga Federal District tariffs, we have calculated single-part and two-part tariffs for the power transmission in industrial enterprises in terms of three typical schedules of electricity consumption. To compare the efficiency of the price-dependent demand management for the electricity transmission in different regions of Russia, we have introduced the indicators “coefficient of the transmission tariff” and “integral coefficient of the transmission tariff”. Furthermore, we made calculations for 65 regions of Russia entering the price zones of power wholesale market. As a result of the analysis, we divided Russian regions of Russia according to the indicator of “integrated coefficient of transmission tariff” in 3 administrative groups. For each group, we have developed recommendations on pricedependent demand management for power transmission. The theoretical significance of the research consists in the development of methods for the analysis and selection of the most appropriate industrial enterprise tariff for electricity transmission. In practice, regional authorities can use the developed groups of regions to change the structure of regional tariffs in order to stimulate consumers to price-dependent power consumption. Moreover, the algorithm for calculating tariffs for electricity transmission can be applied by the industrial Russia enterprises in price-dependent demand management of power consumption to choose an optimum tariff and reduce costs on power transmission. This article discusses the problems of ensuring the innovative security of regional development in a digital society. The hypothesis of the study is to suggest that the emergence of digital technical and economic paradigm is accompanied by innovative regional development risks and introduces significant changes in the ideology and mechanisms of the territorial innovative security. We have assessed the level of the development of the digital economy and innovation in Russia using the comparative analysis. We have developed a methodological approach based on rating. The approach allows assessing the level of favourable conditions in the regions of Russia for the formation and development of the high-tech sector of the economy. We have suggested the definition of innovative security, which is formulated in accordance with modern views on how to achieve the sustainable development of territories and maintain their competitiveness in the new reality. We have revealed the impact of specific factors of the digital economy on the global and regional innovative processes. The research reveals basic problems and justifies the most promising options for Russia to build the strategy of innovative security. The paper shows that, in the Russian Federation, the absolute priority for innovation security is the development of innovation ecosystem, which would be adequate to the challenges of digital society. This innovation ecosystem should be capable to achieve acceptable (considering the competition in global markets) parameters for the development of science, the high-tech manufacturing sector, and higher education. We have proved that the establishment of the innovation ecosystem of the country is strategically important to start with the regions, holding leading positions on science development, innovative capacity and high-tech industries. Calculations are made using official statistics and allow to define with reasonable objectivity spatial priorities for the innovative security strategy of the country. We have formulated the directions for improving public policies as a mandatory condition for increasing the innovative security of regional development. The results of this research can be used to elaborate a strategy of innovative development as well as to address practical issues of managing innovation processes of the territories and to enhance the sustainability of regional development. The focus of the article is the research of opportunities to improve the state support of the Russian Federation’s modern agriculture. The purpose of the study is to choose the most effective options for providing financial aid according to the indicators of its social and economic development. Moreover, we aimed to select the best ways of this financial aid’s distribution within areas and in the agricultural enterprises. The article highlights underestimated opportunities to increase the effectiveness of material and financial assistance to the agricultural sector. These opportunities do not consist uniquely in increasing financing but also in reasonable principles of using support funds by the agricultural enterprises. To this end, I propose to identify the directions of economic development, which are both profitable for an agricultural enterprise itself and meeting the goals of the overall social and economic development of the region and the interests of its population. Priority in obtaining state aid should be given to those enterprises whose production activities contribute to social and economic development of the region. The author’s multi-years research together with the scientists of the institutes of the Russian Academy of Agricultural Sciences and the Russian Academy of Sciences have allowed to identify the main reasons for the delay in the development of Russian agriculture in 2005–2016. In addition to the well-known negative impact of the shortage of funds and unfavourable natural conditions on the economy of agricultural enterprises, I found other reasons such as a weak development of the labour market and technologies, neglect of social, physical and industrial infrastructure. At the same time, the negative influence of these reasons is noticeably stronger than the negative influence of traditional factors. In this regard, the article proposes to improve the practice of allocating support funds. Funding should be used not only for on-farm, purely industrial needs but also for these enterprises’ social and economic development, as well as for the overall development of their region. I have applied the economic and statistical methods, analytic and computational algorithms processing a large amount of information on the development of agricultural production of the Russian Federation and foreign countries. As a result of the research, I propose areas for the improvement of state policy protecting agriculture. It will be useful to the regional authority and regional administrations, heads of the agricultural enterprises as well as scientific experts in the field of agricultural economics. At present, the entities of the agrarian sector are moving towards the digital, intellectual and robotic technologies or the robotization of the industry. Robotics is used in the various fields of the agrarian sector, the most widespread is the milking robotics. From 2006 to 2016, in the agricultural enterprises of the Russian Federation, 393 units of robotics were introduced. While in the Sverdlovsk region at the beginning of 2018, 37 units of this equipment have been used. We suggest to use the indicator of “density of agricultural robotization” to characterize the effectiveness of the transition to robotics. This indicator for Russia increased from 0.02 to 0.78 units, and for the Sverdlovsk region — from 0.3 to 3.17 for the periods under review. However, the slowdown and low values of the density of agricultural robotics make it necessary to develop appropriate measures. The article proposes a model of an organizational and economic mechanism for the transition to robotics. It includes target, investment, technical and technological as well as personnel sections. The initial data on the state of the introduction of robotics in agricultural organizations was provided by the ministries and departments, as well as statistical bodies. We determined scenarios of inertial, targeted and system development of robotics in agriculture depending on the level of state support. We have determined that the investments needed for the robotization of agricultural enterprises in the Sverdlovsk region are at the level of 472 million rubles. Moreover, we have formulated the tasks, recommendations and the expected result from the training of personnel capable to master robotics in the industry. The most important measure is the reduction in the cost of this equipment due to its domestic production. The results of the research can be used by the executive authorities in developing programmes for the innovative development and technical modernization of agriculture. Does Agriculture Matter for Economic Growth of Uttar Pradesh (India)? Twenty-five years have passed since economic reform in India. It brought about many macroeconomic policy changes in the economy. Although these policy changes helped the manufacturing and services sector to grow, agriculture did not get any direct benefits from economic reforms. It was assumed that it would get indirect benefits due to changes in exchange and trade policy, liberal industrial licensing system and reduction in industrial protection, which would benefit tradable agriculture by ending discrimination against it and by turning the terms of trade in its favour. The present study examines the transformation in agriculture and basic contributory roles i. e. product, market, and factor contribution of agriculture in the economy of Uttar Pradesh. Further, a long run association and causal relation between agriculture and other economic sectors and sub-sectors are explored. An understanding of the relationship between agriculture and overall GDP growth becomes important from a policy maker’s perspective, as it would guide the decisions in allocating the scarce resources to attain growth and development. Results show that Product, market, and factor contribution has increased over the years. Empirical estimates show that agriculture is a driver of the unregistered manufacturing sector, transport storage and communication sector; and overall economy as a whole. Public investment in irrigation should be accelerated, cost-effective and yield-raising technology should be accessible to medium and small farmers. Micro and small agro-based enterprises should be established according to specific regional crops, so they can work closely with the agriculture sector and reap the benefits of easy availability of raw material. Determine the External Debt Threshold of the Southeast Asian Countries: Analysis Using Laffer Curve? This paper research the relationship between external debt and economic growth. Using the debt Laffer curve theory, the authors determine the maximum debt level of the Southeast Asian countries. Secondary data period 2006–2014 of 10 countries of the Association of Southeast Asian Nations are collected from the Asian Development Bank and the International Monetary Fund website. The authors use the method of regression for balanced panel data with a fixed effect model. The research results indicate that there exists a nonlinear relationship between external debt and economic growth in the Southeast Asian countries, including five variables: budget balance to gross domestic product, the lag of gross domestic product growth, the ratio of total investment to gross domestic product, the ratio of external debt to gross domestic product and the ratio of debt payments on exports of goods and services. These five variables are significant statistics and explain the meaning 24.87 % of the model. The other two: trade openness and trade index are not statistically significant. On the other hand, the research results have found the maximum debt level of the Southeast Asian countries, which is 70.42 %. Based on the study results, the authors suggest some recommendations to help the government of the Southeast Asian countries to build up the maximum debt levels, in line with the socio-economic development goals of their countries in each period. The research is focused on the evaluation of regional differences by the level of deposit risk. Deposit risk is connected with resources sustainability of regions and can constrain the transformation of attracted deposits into credit and investment resources. The literature review shows that previous works were primarily focused on deposit risks at the micro level, that is, at the level of a bank. The Bank of Russia uses the same inductive approach to assess the financial sustainability and development prospects of credit institutions at the regional and national levels. However, the execution of prudential regulations by banks, in particular, liquidity ratios, does not allow to make a precise estimation of the differences among regions in terms of deposit risk. The presence of imbalances in the territorial concentration of credit institutions can affect the volatility and cost of deposit resources. The purpose of this paper is to improve the scientific and methodological approaches for assessing deposit risk. For this purpose, we propose to use cluster methods for classifying the regions based on the revealed internal links between deposit risk indicators. In contrast to previous scientific works, we offer to use semi-dispersion for calculating the volatility of deposits. The volatility of deposits can be interpreted as a measure of adverse downside risk. Furthermore, we propose the nominal scale to distinguish the different level of deposit risk. The research results confirm that there is a nonlinear linkage between the territorial concentration of credit organizations, level of provision of regions with banking services as well as volatility of deposits at the level of regions. We have revealed that the concentration of banking business in all regions is more closely connected with the sustainability of bank resources. The scientific approach to deposit risk evaluation presented in the paper expands the system of indicators for the development of the economy of regions. This approach can be used for both the monitoring of the financial and economic development of the regions of the Russian Federation and the macroeconomic forecasting.